Lay the steak on a chopping board and rub with a little olive oil. Season and sprinkle with the rosemary and oregano. Cover with grease-proof paper and pound lightly with a rolling-pin or the bottom of a saucepan until the steaks are slightly flattened out and the herbs and seasoning are nicely pressed into the meat. Put a large griddle pan on a high heat and, as it’s heating up, toast the ciabatta on both sides. Keep the toast warm. Shake any crumbs out of the griddle pan, then return to the heat and lay the steaks in it, side by side. Cook for about 8 minutes, turning every minute, for a medium steak, or a little longer if you like your meat more cooked. Lift the steaks out of the pan and let them rest in a warm place. Spoon a tablespoon of pesto on to each of two warm plates and smear out across the plate with the back of the spoon. 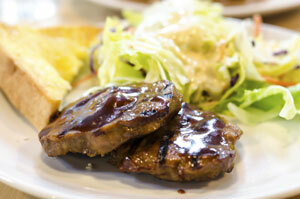 Place a steak on each plate and pour any resting juices over the top. Rub the toasted ciabatta with the garlic, drizzle with a little olive oil and put a piece on top of each steak. In a mixing bowl, toss the salad leaves with the lemon juice, a lug (approx. one tablespoon) of olive oil and a pinch of salt and pepper. Divide the salad between the plates and serve. Serves 2. Recipe compliments of Jamie Oliver. 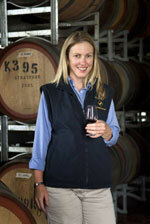 Fruit for the Moonstruck Shiraz was harvested from select vineyard sites within Central Victoria, Australia. The highly anticipated 2012 vintage has produced some excellent wines with beautiful balance and length of flavor. The harvest was short and fast with whites and reds ripening early in the season, and good Autumnal weather to follow. The resulting wine is ripe, complex and wonderfully rich and brooding, due to the distinct Shiraz parcels of fruit. Overall, the quality is remarkable and the resulting wines will live on for many years to come. Enjoy this wine on its own or with rustic tomato based pasta, charcuterie or steak. This entry was posted in Recipes and tagged australian wine, food pairing, grilled steak, moonstruck, paso robles, recipe, Shiraz, steak salad, wine, wine pairing. Bookmark the permalink.